Is it time to deal with your debt? If your debt has ballooned out of control you know exactly how stressful it can be. You wonder if you're ever going to find a way out of debt and you might have missed a bill payment (or 5). Even worse, you may have a poor credit rating due to late payments and/or defaulting. You might be at the stage where the debt collection agencies are ringing your phone off the hook. Wouldn't it be nice to get a lower interest loan so you can pay off all your credit cards, and your car loan. Wouldn't it be nice if you could get caught up on your phone bills, utility bills, and department store credit cards (or whatever lines of credit you may hold at the time). Yes. It would be nice, and that is where we try to help you out. 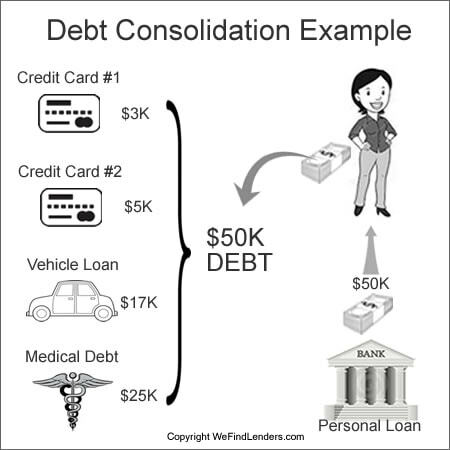 A debt consolidation loan is when you borrow money from one lender to pay off multiple lenders. As shown in the image below, the young woman borrows $50K from a bank (or credit union) to pay all of her debts. A debt consolidation loan usually has a much lower interest rate than your existing debt. There are multiple ways to borrow money to consolidate debt and below we explain further. You can get a secured loan, unsecured loan, credit card balance transfer, HELOC loan, 401K loan, or debt settlement. Lender transfers the money into your acct. Have an active checking or savings acct. Is Consolidation Right For You? Like anything, there are different opinions. Some experts believe that debt consolidation is a bad idea because so many debtors end up clearing off their debt with a consolidation loan, then turn around and start spending recklessly again. And they're right. A lot of people fall into that trap. But if you are disciplined, and determined, you can get one loan at a much lower rate and save a lot of money over time. Below is our rough guideline that may help you decide. Everyone's finances is unique so you have to take an honest assessment of your current financial situation, and make an educated decision. Consider getting professional debt counseling, talking to co-workers, relatives, loan officers, etc., so you can bounce some ideas around. You haven't learned from your mistakes: Sometimes people end up in debt with no fault of their own, but in most cases the debtor made mistakes. It's a MUST that you don't consider a debt consolidation unless you have a strict budget, lifestyle plan, and future goals to adhere to. Here is a video with another take whether or not you should consider a debt consolidation loan. Just like our other testimonials you can really feel how these people struggled to find a willing lend who would take the time to grant them a debt consolidation loan. We pride ourselves on getting as many offers as possible for every applicant who uses our pre-app to find a good and honest lender near them. We will be adding many more testimonials to this page into the future. Once you've been approved for your consolidation loan, pay off your first creditors immediately. Don't give yourself time to stray off and start spending that money on stuff. After you've paid off all your first creditors, and have one payment per month, you need to change your spending habits. This will mean changing your lifestyle, and exercising discipline. Here are some ideas to get your started on the right track. Here is a video made by a smart young lady named LaTisha Styles who made hard lifestyle choices to pay down debt quickly. Should You Be Consolidating Your Debt? You can apply here using our Standard Debt Consolidation Loan App method if you don't want to read about the usury laws in your State regarding APR, interest, and fees. However we encourage you to use the Fast Loan App method.